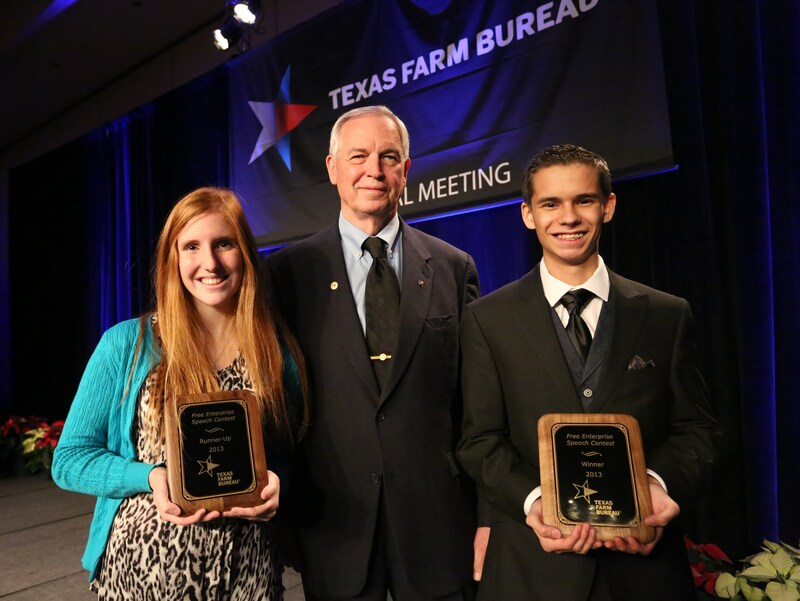 SAN ANTONIO, Texas -- A junior in a homeschool program from Austin took first place and a $6,000 scholarship as winner of the 2013 Free Enterprise Speech Contest at the 80th Texas Farm Bureau annual meeting. Collin Warwick, 16, son of Billy and Tina Warwick, topped 11 other speakers from across the Lone Star State in the annual contest. Warwick is active in 4-H, receiving the "I Dare You" Award and serving as a member of the Travis County 4-H Advisory Board. He plans to attend The University of Texas and major in mechanical engineering. Runner-up in the Dec. 7 contest and winner of a $3,000 scholarship was Elli Diehl, 17, high school senior from Tolar in Hood-Somervell County. The daughter of Bob and Laurie Diehl, she plans to attend Texas A&M University and major in food science. At Tolar High School, she is president of FFA and 4-H. She also is a University Interscholastic League (UIL) State Editorial Writing champion. Four other finalists were named, including Bailey Bales of Bailey County, Mikhaila Barnett of Mills County, Blake Mosley of Live Oak County and Samuel Alders of Nacogdoches County. Each received a $2,000 scholarship. Other contestants were Hannah Stiles of Wheeler County, Hance Winingham of Montague County, Tud Krier of Wood County, Mallory Aleman of Menard County, David Rihn of Medina County, Jamie Scherbeh of Colorado County and Jewel Jimenez of Wilson County. All contestants received a $1,500 scholarship and an expense-paid trip to Washington, D.C.
Collin Warwick of Travis County FB and Elli Diehl of Hood-Somervell County FB have been named the winner and runner-up, respectively, of Texas Farm Bureau's 2013 Free Enterprise Speech Contest at the 80th annual meeting in San Antonio.